Rogialyn Gandalf was our junior sire in 2013. I saw this fellow when still on his mum just before weaning and he stood out as the best calf on the property. His dam, Tarellla W1, has bred some superb animals and will continue to influence the breed with standout progeny for years to come. She has some amazing daughters in the Rogialyn herd. Gandalf’s sire, Willalooka York Y96 has stamped his name right across the breed. Both Gandalf’s sire and dam have fantastic feet and legs. We were also attracted by his combination of a low birth weight and 200 day weight greater than 30, as well as his positive fats. Gandalf has been tested for coat colour and has the perfect silver Murray Grey genetics: double black (ED/ED), homozygous for the diluent gene (DLH) and dun free (DNF). 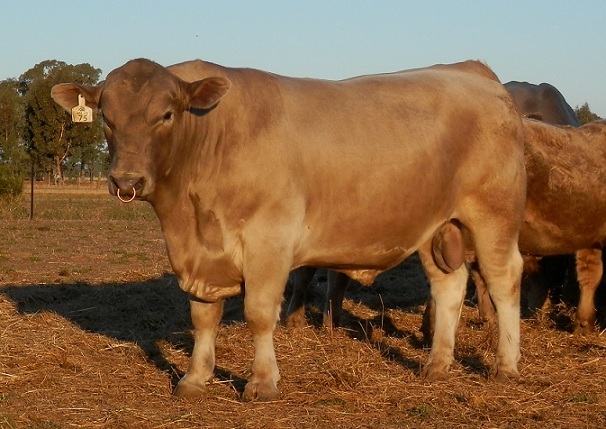 There is a great article by Roger and David Houghton on the genetics of coat colour in the 2012/13 Murray Grey Annual.